Los Patios is a municipality in Norte de Santander Department. The history of this community begins in the 17th century. It began as the hacienda "Los Patios", which developed into a small country town, which later became a corregimiento de Villa del Rosario and still later, on 10 December 1985, the 37th municipality of Norte de Santander. According to historical records, the proprietors of the original hacienda included Juan Aranda, Carlos Matamoros, and Reinaldo Viccini, who engaged in agriculture, principally of cacao. The flag of Los Patios is horizontally divided white-green-yellow. Information in Spanish: "La bandera del Municipio de Los Patios fue creada por Decreto 030 de Diciembre 4 de 1986, durante la administración de José María Pezzoti y el secretario general Pablo Antonio Guerrero, con los siguientes colores: Blanco que simboliza la paz Verde que simboliza la esperanza Amarillo que simboliza la riqueza." 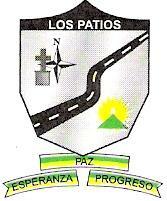 "The municipal flag of Los Patios was approved by Municipal Decree No. 030 on 4 December 1986, during the tenure of José María Pezzoti as Mayor and Pablo Antonio Guerrero as Secretary General. White symbolizes peace, green symbolizes hope and yellow symbolizes richness." The scroll placed below the shield on the municipal coat of arms has the same colour pattern as the flag.